The 525-horsepower custom truck is her pride and joy. She knows it bumper-to-bumper, maintains it meticulously and services it thoroughly after every run. In fact, she routinely takes it all apart and puts it back together — because when it comes to the world of professional off-road racing, attention to detail counts. “It’s amazingly chaotic,” Sarah Burgess said of her sport as she navigated the bay of her workshop at Utah Motorsports Campus in Grantsville last week. Sparks flew from her truck as her husband, Adam, used an angle grinder to prep the chassis for a weld. “But it’s an amazing lifestyle here in Tooele. It’s like being on permanent vacation,” she said. Burgess’s company, BMI Racing, operates full-time out of UMC, and is entirely a family affair. Sarah is the owner and driver, while Adam serves as crew chief and engineer. Their 16-year-old daughter, Bridget, joined the team driving her own truck last year. “It’s a lot of family time together,” Burgess said. Burgess was the only Utahn to compete in the Lucas Oil Off Road Racing Series at UMC last month, placing fifth in the event. She races in the Pro Lite class, which features mid-size V-8 trucks that resemble pickup trucks, only leaner and meaner, and with more extreme angles. The Burgesses are currently preparing for their next event in San Bernardino, CA. The series runs through October. Burgess was born and raised in Brisbane, Australia, where she got into extreme sports at a young age, starting with BMX bike racing. She says the fact that racing is a male-dominated sport doesn’t faze her. Nor does she get any grief from the guys she races against. Burgess fell in love with the automotive industry in 2000, when she accompanied Adam on a business trip to the U.S. and attended a National Hot Rod Association drag race. The Burgesses moved from Australia to the Los Angeles area in 2008. Burgess estimates that the family has driven more than 300,000 miles across the country over the last decade. When racing events brought them to Tooele Valley, the Burgesses knew they were finally home. They relocated to Tooele City in June. Burgess says she was especially touched by local Independence Day celebrations. “We were driving on up Main Street on the 3rd of July and everyone already had their chairs set up for the parade, and that’s amazing,” she said. When they’re not on the road, the Burgesses spend most days in their workshop near the off-road track at UMC. Bridget is home-schooled, which allows her the flexibility to work ahead in order to spend time at the track. Burgess noted with a smile that while Bridget has been racing in her own truck for two years, she only recently got her driver’s license. As owner of BMI Racing, Burgess wears many hats. She personally manages marketing and writes all proposals. Fabrication, engineering and technology are also handled in-house. But although she’s learned to enjoy the business aspects of her operation, it’s the dirt track behind the workshop that speaks to her soul. Burgess says that while the skills of driving a track can be learned over time, qualities like bravery, discipline and decisiveness are critical to off-road racing. Burgess speaks from experience; she’s rolled her truck 12 times. On one occasion, it rolled four times before coming to a stop. And while she delights in the uncertainty of it all, she speaks about maneuvering the track as if it were a science — a mere matter of analysis and iteration. Burgess believes the lessons she has learned on the track are applicable to everyday driving, and she takes every opportunity to pass them along. Last year, she partnered with a sponsor to provide a series of women’s car-care clinics that educated women about the various issues that can arise with their vehicles. “We talked about what certain dashboard lights mean, when to panic and when not to panic,” she laughed. Burgess plans to hold similar events specifically for millennials and younger drivers. She says she’d love for UMC to hold winter clinics for driving safely in bad weather. The Burgesses received their Green Cards last year and are working toward U.S. citizenship, something Burgess considers an incredible privilege. Burgess says people often assume that since she’s a professional racer, she must have come from money. The following piece originally appeared in the February 16, 2016 edition of the Tooele Transcript Bulletin. Sometimes, the greatest treasures are those that lie closest to home, often hidden in plain sight. Take, for example, the antique metal slide projector in Ed Dalton’s basement, which he stored there after his father passed away over a decade ago. It was only recently, while planning for a family reunion, that Dalton’s thoughts turned again to Dad’s old projector. That’s when the retired educator unlatched the heavy black box and noticed — for the first time — the small compartment built into the end of the case. “It was full of slides,” recalled Dalton as he ran his finger along the stack of 35mm photographic slides that had sat undisturbed in their accidental time capsule for nearly 70 years. He left the projector alone for fear of damaging it, but eventually a light table would illuminate the tiny transparencies and trigger an avalanche of nostalgia. There was a row of single-engine planes against an Oquirrh Mountain backdrop, a group of men posing beside a plane with the words “Toolee Bell” painted proudly on its nose. Another slide depicted Dalton’s sister, Brenda, at age 5 or 6, perched on the wing of their father’s plane. Some of the slides were scenes from family trips. A few revealed Tooele City from the air. Most, however, captured the golden age of aviation in Tooele Valley — the lively postwar days when pilots flocked to the narrow airstrip southwest of downtown Tooele, hungry for air. “It was a little treasure trove,” said Dalton. Specifically, Dalton’s slides focus on the Tooele Flying Service and the non-commercial Tooele Flying Club, which were organized shortly after World War II by a group of pilots, businessmen and community leaders in Tooele. The most detailed account of their history comes from the journal of Tooele businessman LaVar Tate. According to Tate’s journal, the idea for a local aviation hub sprung from a dilemma: he loved to fly, but the closest airstrip was in Salt Lake City. Tate purchased 80 acres of land in southwest Tooele City in the early 1940s to create Tooele Valley’s first airstrip. According to Tate, the dirt runway was graded with equipment from the Tooele Ordnance Depot by prisoners of war who were employed there. A hangar large enough to house two small planes was built with financing help from local physician Herb Milburn and Buck Inglesby. After the conclusion of World War II, Tate and Milburn organized the Tooele Flying Service and purchased their first plane, an Aeronca Chief, which they christened the “Toolee Bell.” By the mid-1940s, the fledgling airport boasted a flight school, several trainer aircraft, flight instructors and a mechanic. Private and aspiring pilots flocked to the airstrip, their numbers bolstered by returning war veterans. Among those veterans was Dalton’s father, Edward Dalton III, who had served in the U.S. Army. Another member of the Tooele Flying Club, Frank Eastman, was the company pilot for McFarland and Hullinger, a Tooele-based mining contractor that leased hangar space at the airstrip for its planes until 1987. Eastman often flew company founders Fayette McFarland and Sidney R. Hullinger to meetings in the region and return in storied fashion. It is unknown exactly when the Flying Club itself was formed or what specific events it might have held (Tate makes no mention in his journal entry), but Dalton said it provided a unique pastime for many local pilots. The airstrip was deeded to Tooele City around 1948 so the Army Air Corps could pave the runway, but even then, takeoffs and landings could still get rocky. Former Tooele City Councilman Dave Faddis recalls driving the length of the runway to remove rocks and debris. Regardless, the airstrip eventually became known as the Tooele City Municipal Airport. It saw continued use until concerns about westward residential growth halted plans to develop it further. It closed in 1989 when Bolinder Field (now Tooele Valley Airport) opened in Erda. According to Faddis, the airstrip’s five hangars still stood at least into the late 1990s. Today the area is known colloquially as Tooele’s Education Corridor and is home to the Tooele Applied Technology College, the Tooele Community Learning Center and the new Utah State University Science Building. There’s not much left of Tate’s aviation hub today, but as with Dalton’s slides, glimpses of the past can still be had. Most of the old airstrip still exists behind walls of brush and long grass, extending southward from the new USU building toward the Stockton Bar. Dalton doesn’t know how or when the Tooele Flying Services and club officially disbanded. He said his father’s involvement largely ended when a stiff wind flipped his plane upside down on the flight apron. But that didn’t stop the elder Dalton from flying when he had the opportunity, and it didn’t curb the younger Dalton’s affection for the old airstrip. This piece originally appeared in the September 22, 2016 edition of the Tooele Transcript Bulletin. “Are you going through?” Emily Johnson asked her friend, Rachael Anderson, as they perched atop a ladder in the historic Grantsville First Ward Meetinghouse last Saturday afternoon. Anderson aimed her flashlight through a small opening in the adobe wall, illuminating the vacuous attic beyond. The decision was a no-brainer, and with an animated “yep!” she disappeared through the dusty portal. More than two decades have passed since the childhood friends first explored this attic and peered through tiny ductwork holes into the chapel below. The beam from Anderson’s light danced across the exposed rafters, scanning for the spot where they had signed their names in dust. The friends had come to the old chapel at the corner of Clark and Cooley streets for a special open house celebrating the 150th anniversary of its dedication. The building’s current owners, Kelly and Macae Wanberg, said they couldn’t let the milestone pass without paying tribute to its legacy. Former Grantsville mayor Byron Anderson also attended the event, along with several other families with ties to the chapel. Construction of the chapel probably began in the late 1850s, according to Craig Anderson of the Sons of the Utah Pioneers, Twenty Wells Chapter. Prior to its construction, church services were held in a primitive log hall southwest of the site on what is now Cooley Street. The building directly west of the chapel (now the Donner Reed Museum) was the original schoolhouse. These buildings were situated at the heart of the early settlement, which was surrounded by a wall made of adobe brick and mud for protection from Indian raids. The new meetinghouse would also be built within the walls of the fort. The new church was built under the direction of Hugh Gillespie, an early Mormon pioneer who cut stone for the Salt Lake LDS Temple. Gillespie designed the Greek revival structure in the traditional style of early LDS buildings, with a gable roof and a vestry on the rear side. The chapel’s walls were over 2 feet thick and built with adobe bricks fashioned from mud and hay, then plastered over with stucco. Inside, a pair of kerosene lamps hung from ornate rosettes in the ceiling. The lamps could be raised and lowered through the rosettes via framed pulley systems in the attic. Similar rosettes can be found in the Salt Lake Temple. The meetinghouse was dedicated on July 14, 1866, with many LDS dignitaries in attendance. The beloved structure remained central to religious and social life in Grantsville as the community grew. The first major upgrade to the building came in 1952 with the addition of a wing of classrooms on its east side. The Grantsville Ward (now the Grantsville First Ward) called the chapel home until 1978 when it relocated to a modern facility. The meetinghouse was then sold to Tate Mortuary for use in viewings and funeral services. It was listed on the National Register of Historic Places in 1982. The building holds the distinction of being one of the oldest continuously-used buildings in the region and one of the only LDS meetinghouses of the era still standing. “Every Church president from Brigham Young to David O. McKay has given an address from this pulpit,” Anderson said. The church was then used as a residence — first for the Pectol, then Hamatake families. Anderson, the seventh of nine Pectol children, spoke nostalgically of her childhood spent in the old church. As a close neighbor and Anderson’s best friend, Emily Baird Johnson also spent considerable time at the building. By the time the Wanbergs purchased the chapel in 2011 with hopes of starting a theater and drama school, the building’s west wall had become dangerously unstable and threatened the entire structure. The Wanbergs hired a contractor to shore up the wall with reinforced cinder block, then added interior pillars to prevent the ceiling from collapsing in the event of an earthquake. The renovated assembly hall, known now as the Old Grantsville Church, features a stage and an open floor. It bustles with drama students, theater audiences and wedding parties. She says her favorite part of theater is watching children who lack confidence or have disabilities stand in front of an audience and receive applause. The children’s theater side of the business recently finished its run of “Jack and the Giant,” and the dinner theater will present Rodgers and Hammerstein’s “The King and I” in October. Saturday’s open house featured a historical presentation by Craig Anderson and performances of selected numbers by cast members of past and upcoming productions. Guests enjoyed cake while reminiscing about their experiences in the chapel. For Anderson and Johnson, now in their early thirties, the memories came flooding back. They remembered pretending to be animals on the old rostrum ledges and jumping from the pulpit onto a trampoline that the family set up in the room. They remembered spooking their friends by stepping on a particularly creaky part of the floor. Then they remembered their trek up to the attic and the signatures they left in the pioneer dust. And with that, they headed for the stairs. The search for their signatures was ultimately unsuccessful, but it afforded the friends a veritable trip back in time. They marveled by flashlight at the strands of hay and finger impressions still visible in the exposed adobe bricks. There was the hand-hewn truss system that still so ably supports the roof. There was the pulley rigging for the kerosene lamps, and the boulder that acted as a makeshift counterweight for them. It was as if the clock had stopped in 1866. “This has made my day. My month. Possibly my whole year!” exclaimed Anderson. The Wanbergs later joined the ladies in the attic. Although she had once looked inside, this was Macae Wanberg’s first time climbing through. Last summer I was contacted by BYU Broadcasting to provide commentary for a new documentary about Great Salt Lake and Saltair. I had a wonderful time working with Director Rob Sibley and his crew, and I think the documentary turned out great. The 54 minute piece, titled Great Salt Lake: Utah’s Sanctuary, covers the history, wildlife, art and recreation of Utah’s inland sea. The recreation section is where I come in. I discuss some of the lesser known, early resorts along the lake’s shores in addition to Saltair. In addition to the commentary, the documentary features some rare film from the old days and some stunning aerial footage– all set to a masterful ambient soundtrack by composer Marden Pond. The broadcast premiere was 12/6, with a repeat tonight (12/10) at 8:30 on KBYU 11. For non-locals, I’m told it will be available on-demand later this month. Check it out, and let me know what you think! Ghost towns? How about a ghost resort? 30 years ago, when Tooele residents Maxine Grimm and Paul Bevan teamed up to spread a little Christmas cheer, they never imagined that their homemade light display would become the valley’s most recognizable—and beloved—holiday symbol. The 30 foot tall display known simply as “the Christmas Tree” became a wintertime staple. Thanks to volunteer efforts and generous donations from private companies, it has returned to its perch atop Little Mountain every year since. The tree’s current incarnation features 400 60 watt light bulbs strung taught from a cell tower. On clear nights, it can be seen as far north as I-80. the pole was visible from virtually anywhere in the valley. The friends had had flown Bevan’s 25 foot American flag from it on patriotic holidays. With a little work and some help from friends, they could transform the flagpole into a giant Christmas tree. Bevan would take care of the technical legwork while Grimm, a longtime community service leader, would fund the project and handle public relations. Dugway Proving Grounds donated two large spools of electrical cable and Grimm talked her sister and several other friends into helping them wire the lights. The work was done at night in the basement of Bevan’s father’s hardware store on Main Street, which is now occupied by the Sostanza restaurant. The friends laid strands of copper wire on long tables and spent long hours soldering patch cables every two feet. “I think I was better at stripping the skin off my fingers than I was at stripping those copper wires,” Grimm laughed. With the donated cable, the total cost for hardware—including Band-Aids—was about $500. They attached standard yellow bulbs and hauled their masterpiece to the top of Little Mountain, where they used the flagpole’s rope to raise the strands to the top. With the lights in place, it was time to breathe life into their giant Yuletide creation. The brilliance lasted about a minute before things went horribly wrong. Bevan quickly cut the power, but only after losing a third of the bulbs. He later realized he had plugged the 110 volt cable into a 220 volt source. Though she laughs about it now, Grimm says there was no smile on her face that night. “It was horrible. We were so exhausted and we thought all that work was gone,” she said. But Grimm and crew persevered. A local electrician re-wired the timer box, pro bono, and Grimm bought new bulbs. The newly repaired tree was re-lit to the delight of the valley’s communities, and the new tradition was born. Grimm said many Tooele residents used the tree as a beacon—a sort of landlocked lighthouse—to find their way on stormy nights. Bevan originally kept the light strands hanging loose so they swayed in the wind like a ball gown. He said the tree had a distinct golden glow that that inspired awe and regularly attracted curious visitors. Once he was visited by a traveler from I-80 who was en route to Salt Lake City when the tree caught his eye. The Christmas Tree was a hit, but Grimm and Bevan realized more manpower would be needed to keep the tradition alive. In 1981, Grimm successfully petitioned the Tooele County Search and Rescue team, and they have maintained the tree since. “She could talk the socks off of anybody,” chuckled Bevan. The process of setting up the tree has changed somewhat over the years for reasons of practicality. The flagpole was replaced by a Beehive Broadband cell tower in the same location, circa 2006. The Search and Rescue team tethered the light strands to steel cables and devised a pulley system that lifts them to the top. The strands are secured to the ground with chains, creating a taught cone shape with a 30 foot radius. The volunteer organization meets every year before Thanksgiving to choreograph the maneuver and make any needed wiring repairs. They set up the tree on the Saturday after Thanksgiving and take it down again on the Saturday after New Year’s Day. The tree is lit every day at dusk and remains lit until 1:00 am. Tooele County foots the maintenance bill, while Beehive Broadband donates the power. Maxine Grimm expressed a deep appreciation for the Search and Rescue team and all that have donated to the cause. Bevan, who has since relocated to Washington County, says the Christmas Tree was probably the most rewarding thing he’s ever been involved in. He plans to create a similar display with a mountainside flagpole he owns in St. George. Grimm wants to someday place a star at the top of the tree, but hasn’t yet come up with a feasible idea. “It would have to be mechanically right or the first wind will take it off!” she said. Tooele County Search and Rescue Commander Fred Denison says he enjoys role in the tradition and hopes the team will maintain the display indefinitely. Jolly Rotor, a local aerial production company, filmed this year’s tree setup. Great video. It’s that time of year again– that season when the sun becomes bashful and shadows drape the gaunt landscape. It’s that peculiar time when humanity actually craves shadow– if on its own terms. We embrace the macabre. We add black food coloring to our macaroni to make it look like worms. We sing songs in minor keys. We snuggle close to watch old Twilight Zone episodes. And we we read spooky things. Ok, so I won’t be cracking it open, but I’ll be there. If you’re a regular BonnevilleMariner reader, you know I love all things Iosepa. What is Iosepa? Just click on the Iosepa category link to the right to read all about it. 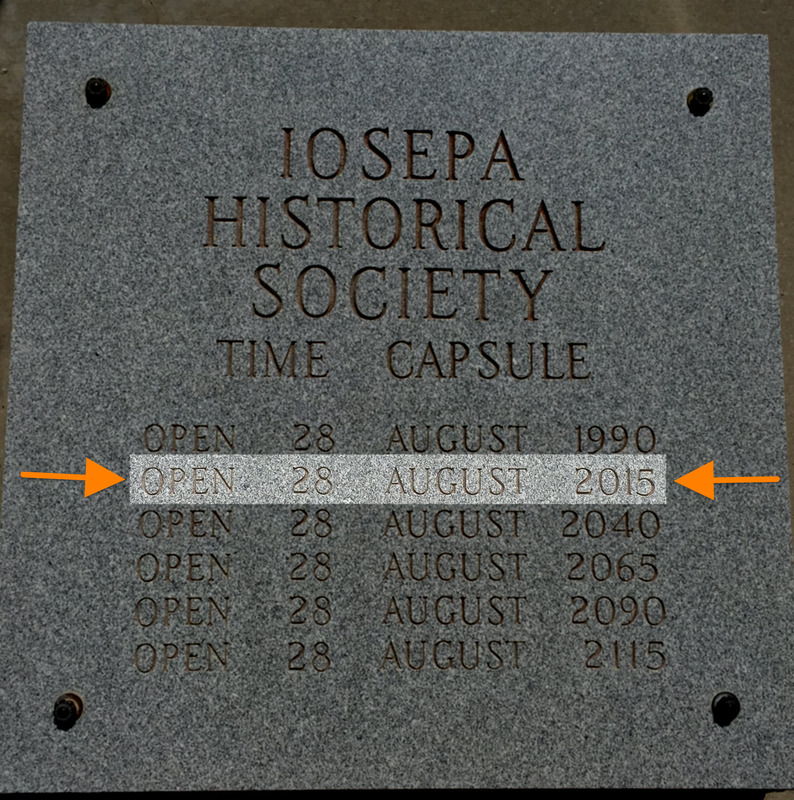 The time capsule will be opened tomorrow, and I’ll be there to cover it. Stay tune for photos, video and a fresh TTB article next week!